After 50 years of experience in textile finishing focused on developing and producing all kind of sueding and corduroy machines, Carù, an Italian company considered a market leader in high quality machines, has been selling its products in all over the world since the 1960s. 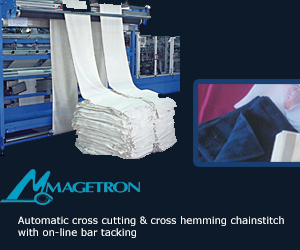 Its range of quality products, are successfully established in markets for woven, knit as well as home textile and technical textiles. Meeting the customers’ requirements, Carù has seen a growing market demand consistent with the increasing of production speed and quality from its innovative machines. Carù prepares a 2018 rich in investments, confirming, once again, that technological innovation in the home textile field is a central point of the company. An orientation, they emphasize in the company, consistent with the basic objectives of the companies in India, which are to increase productivity, quality and further strengthen its role as a reference point for converters and large textile brands. The new Carù pattern sueding technology, with the very latest technical features, combined with modern control equipment and electronics, provides the technical process conditions that are expected of such a process today. Perfect the art of fabric patterning with Carù solutions for any kind of fabrics, which feature are the most advanced technology in the field. Whether richly patterned dress or tie fabrics, upholstery fabrics, damask fabrics, sportswear, labelling or sophisticated technical textile, with Carù machines you can produce a creative and profusely diverse assortment of high quality woven and knits of both and synthetic fibers. Unleash your passion to create imaginative fabric designs.